The base kit is an assembled machine that comes with everything except the router/spindle, computer, and software. This option includes the assembled machine and redSprout CNC computer with electronics pre-wired. Software can be purchased additionally and preloaded on the redSprout. This option includes the assembled machine and redLeaf CNC computer with electronics pre-wired. Software can be purchased additionally and preloaded on the redLeaf. This option includes the assembled machine and redFly CNC control box with electronics pre-wired. This will add a 1.5kW spindle with 110v inverter to your assembled bluechick. Price includes additional materials and installation. The blueChick v4.2 fully assembled CNC machine is a desktop sized CNC machine that has a working area of 12"x36"x3" (X, Y and Z travel distances. The blueChick is perfect for small routing jobs and is designed to use the Porter Cable 892 router, or our 1.5kW spindle. 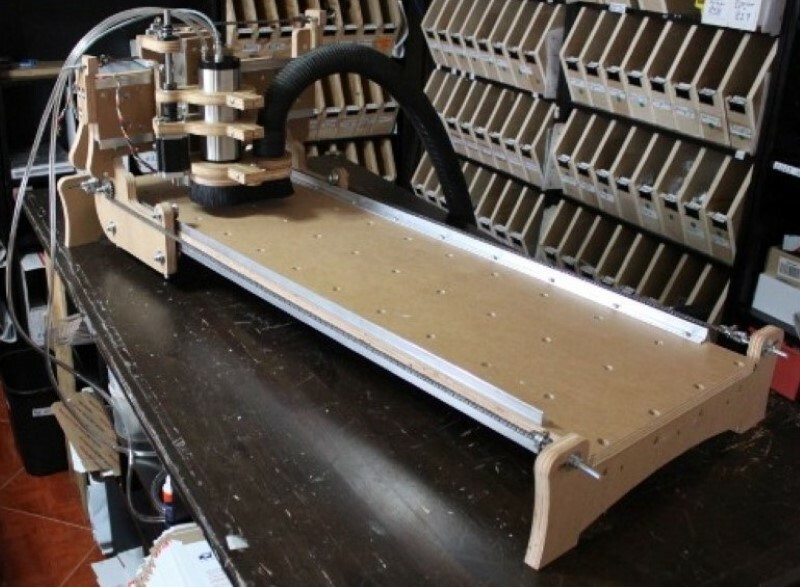 The blueChick is a fully assembled CNC machine capable of routing an area of 12"x36" with a total of 3" of z-axis travel. The version 4.2 was developed to provide an alternative drive method, locate the x-axis motor in a more appropriate location, increase the gantry structure and reduce the overall height of the machine. Additionally, the router selected for this machine is the Porter Cable 892 series of routers. We have several options for this machine. You will be able to purchase the fully assembled machine which will include a 2 week lead time. You supply the computer, cable/wires, and router. If you wish to purchase our Spindle, we include a price option for that as well. With the base price, the electronics will not come assembled. If putting electronics is not your thing, we have the electronics and computer all put together for you with the redLeaf or redSprout option. The redLeaf includes a larger form factor with adequate space for an additional 4th axis. We will build you a custom computer with all electronics pre-wired. It also includes a copy of Windows 7 with a free trial version of Mach3 software pre-installed. With this option, all you need to provide is the Spindle or Router, and you are ready to go out of the box. If you wish to have the electronics and motors mounted and ready to go but you don't need the computer, we have the redFly option in which we will mount the motors and drivers onto a custom built wood box. The z-axis motor is re-oriented to be located next to the router as opposed to the top of the z-axis assembly. This reduces the overall height envelope of the CNC machine, so this machine can sit underneath cabinetry and other areas that have a similar height restriction. The chief difference from the version 3.0 blueChick CNC machine and this 4.2 version is the main drive mechanism. Roller chain was selected for this version to provide more robustness and ease of alignment. There is also a very interesting industrial appearance that comes with this type of mechanism. As with all machines, care should be taken with respect to fingers and other body parts getting into the parts of this mechanism.